Happy Friday, friends! It’s setting up to be a hot weekend here in Minnesota (yes, really, we have those. It’s going to be humid and in the 90s). I plan to beat the heat by spending the weekend at work, as I usually do, and going to small group on Saturday. I’m also working on my son’s Scouting scrap book in preparation for his Eagle Scout court of honor coming up in August. I hope that wherever you are you are keeping cool and doing something fun this weekend. 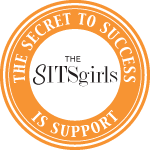 For today’s post, I’m going to share another of my favorite organizations with you. I first became aware of FMSC because they have a food packing facility near my home, and we went there as a work group back when I was doing childcare at a gym. I loved their mission to feed hungry kids around the world and the opportunity to participate hands-on by packing meals. When you visit an FMSC packing facility or mobile pack event, you participate in manufacturing one of three nutritionally complete meal options. The most common, and my favorite to pack, is the original Manna Pack. They also make two potato-based formulas, Potato-W and Potato-D. The potato formulas meet the specific nutritional needs of weaning babies (W ), and people with chronic diarrhea (D), a serious and life-threatening condition for the malnourished. The reason I prefer packing Manna Pack is because the potato powder, the basis for the other two formulas, floats in the air and sticks to everything, including your skin and clothes. It doesn’t hurt anything and it washes right off, but I still prefer original Manna Pack. Manna Pack consists of vitamins (a vegetarian, chicken-flavored vitamin powder), vegetables (dry veggie bits), soy* (a brown, crunchy, cereal-like puffed soy), and rice. Volunteers in hairnets and gloves gather around a table to fill bags with carefully-portioned amounts of each ingredient. They weigh the bags, and pass them off to a sealer (my favorite job), who pops the bag closed, removing as much air as possible, and seals it shut using a commercial sealing press machine (the sealer has to be 18+). A boxer (J’s favorite job) at each pair of tables boxes up the meals, keeps a tally of the boxes finished by his tables, and calls out cheers to keep everyone having fun and to let the warehouse volunteers know that they need to come get another completed box. FMSC’s nutritionally-complete meals are paid for my donations, and packed by volunteers, and each meal costs less than twenty-five cents to produce. The boxes of food are loaded onto pallets and shipped to partner organizations around the world. These partners use the FMSC food in their various missions feeding orphans, refugees, and hungry children around the world. For example, some of Venture‘s work uses FMSC meals. Packing sessions at FMSC take place six days a week, daytime as well as evening. A packing session lasts a couple of hours from the orientation rally to the closing (optional) prayer over the pallets (FMSC is a Christian organization, although they do not require you to have any faith connection to come and pack nor to receive meals). Children five years and over can participate, though there are rules for how many kids/per adult you can have in your group (and that number varies depending on the kids’ ages). You will have to wear a hairnet the entire time you are at the packing facility, and you cannot wear any jewelry, so it’s best to leave that at home. You can get more information on packing locations and rules on the FMSC website. If Mobile Pack is coming to your area, or if you live near a permanent facility, I highly recommend you donate and/or try packing meals at Feed My Starving Children. It’s a great experience and a free outing for the whole family (or small group, book club, work group, birthday party, etc.). The organization is reputable, and their work (YOUR work) is life-saving. Have you packed meals at FMSC or another similar organization, or worked with a partner organization that distributes the meals to hungry kids? Tell us about it in the comments! *Please note that soy is used throughout the facility, so if you have a serious soy allergy, you should probably confine your support to financial giving. If your soy allergy is mild or limited to actually eating soy, you can go to a packing event. The staff will put you to work labeling bags or something of that nature away from the packing room. Years ago, I struggled to find my passion and my place in this world and in the kingdom of God. I was still involved in helping out here and there and giving a little to this and that, but I felt like my meager efforts were spread so thin, and I wasn’t sure I was making an impact anywhere. I prayed for God to give me a specific passion, something to focus my efforts to multiply my impact. I actually sat down and made a list of all the things I was involved in and all the things I really cared about. That thought and that exercise were part of my journey, and as my passion for hunger began to reveal itself to me, that thought about spreading or concentrating efforts stuck with me. So I have introduced you to a number of programs and organizations that are helping the hungry, and there are many more to come. But I don’t want that to become overwhelming to you. I don’t volunteer or donate to every hunger cause, and I don’t automatically say no to every non-hunger thing that comes up. So in the interest of transparency I’m going to let you in on what I actually do for those in need. I hope it helps you clarify your mission and learn to say yes or no with confidence instead of guilt. First, as a Christian I believe that I am called to give 10% of my income to the support of the church (Malachi 3:10, Leviticus 27:30, Deuteronomy 14:22). Some people accept this responsibility but include their other charitable giving in this number, and some think that tithing went out with the Old Testament. They both make good points, truly, and I don’t condemn anyone who sees this differently than I do. But if people are tithing by giving to a different charity or not tithing because they no longer feel obligated, how will the church survive? Because I believe in my church, because I want to live a more generous life, and because I see it in the Bible, I have chosen to give the first 10% of my income to my local church. In my heart AND in my checkbook I am invested in my church. For us, that’s the big one. But there are smaller things we do on a regular basis or on occasion. We have a sponsored child through Compassion International. That costs us a mere $38 a month, and it lets us invest in the life of one individual. We also keep mini M&M tubes to collect quarters for Feed My Starving Children. When they’re full, we schedule a time to go pack meals at their facility and swap out our full tubes of quarters for new empty tubes. And of course there’s Food Shelf Friday. Every Friday night (or another night if Friday doesn’t work) my family exchanges our regular meal for a simplified meal like food shelf users receive. The experience makes us more thoughtful donors (aware of things like protein sources and sodium overload in canned foods), and the savings allows us to donate the identical meal. I collect our Food Shelf Friday duplicate meals in grocery bags in my home office. When the bags are full I take them to my church’s food bank. Sometimes I donate it somewhere different. The Scouts and the mail carriers both hold door to door food drives. In October I’ll probably be giving it to another food shelf, as I am hoping to do a tour and interview for the blog, and in December I’ll bring my stash to work for the food drive we do at our annual community Christmas event. So that is my family’s regular giving plan: tithe, Compassion sponsorship, quarters and volunteer packing for FMSC, and Food Shelf Friday. 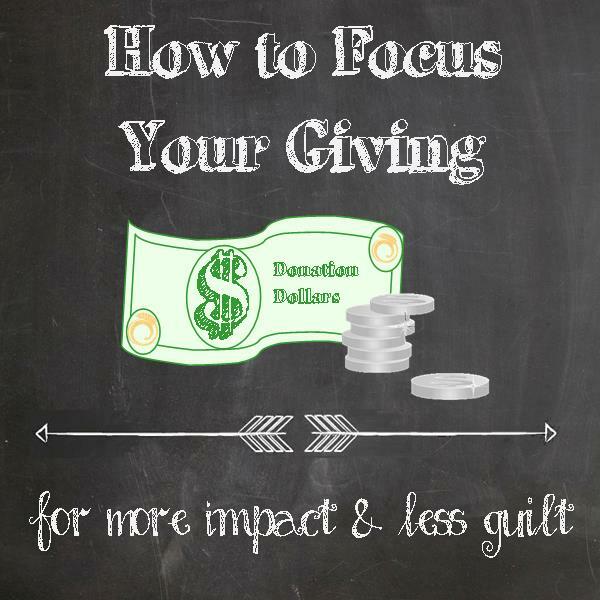 We also chip in now and then to one-time things like the recent Convoy of Hope event, or last fall’s Hope For Dinner. When we can, we give a little for school and sports fundraisers, benefits, and pancake breakfasts. Those things are kind of hit and miss and I don’t really think of them as giving as much as just being part of a community. When asked to donate or participate in something, my first consideration is if I can afford to do that without sacrificing my commitments. Second I ask myself if it will advance the kingdom of God, meet the actual physical needs of people, or help build my local community, because those are the things that matter most to me. This allows me to confidently say yes or no depending on my resources and priorities. First, I hope it helps as you see many FSF posts about different programs and organizations to know that I don’t give to everything. I like to share about these organizations because it might be one that you want to participate in, and also just to give us all hope and faith in humanity by hearing about all the people and organizations that are out there doing good work for the poor. Second, I hope that it helps you evaluate your passions and priorities so you can focus your efforts, giving to and volunteering with quality organizations that share your values and priorities. Leave a comment – share the causes you’re passionate about and the organizations you love! Do you remember those terrible commercials where Sally Struthers would come on the screen and cry about children in need of sponsors? Nothing makes me change the channel faster than a well-paid celebrity guilting me into donating. Don’t get me wrong, I know the need is real, and it breaks my heart. And I love the idea of sponsorship – the letters, the pictures, making an investment that impacts one life instead of being spread thin across an organization. But I’ve always wondered if those things were legitimate or if everyone gets the same little form letter and picture. 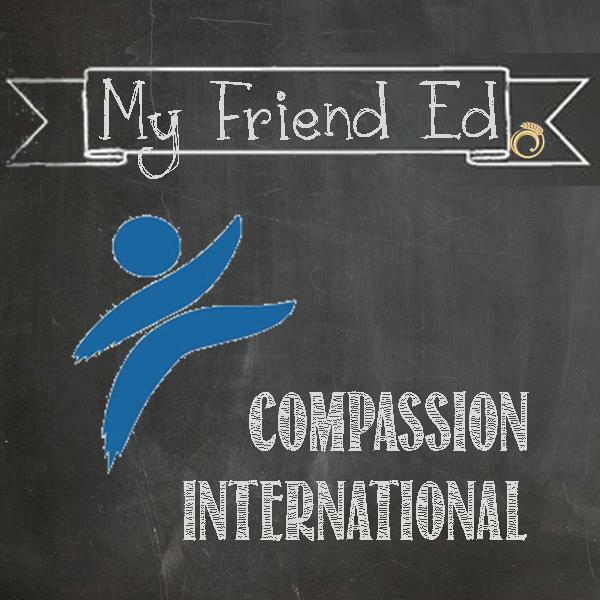 I don’t know which organization Sally Struthers was crying for, but I know legitimate sponsorship exists – it’s called Compassion International. I first learned about Compassion when Christian rock band Audio Adrenaline talked about it at concerts back in the 90s. Then my parents, sister, and a couple friends started sponsoring kids, and they all had great things to say about it. So about eighteen months ago, when my church held a Compassion sponsorship drive, I sent my son to the table to pick out a child. His name is Edouard. He’s six, and he lives in a farming community in Burkina Faso. He likes to play soccer, and he has the most beautiful brown eyes. Every month, Compassion International charges me about $40, and they use that money to provide Edouard with education, including school fees and uniforms, health care, and an introduction to Jesus. He doesn’t write yet, but his teachers at the Compassion center read our letters to him and help him write to us. We’ve gotten pictures of him several times, and it’s fun to see him grow. He has drawn us pictures and asked questions about our lives (he was rather concerned last winter when his teachers told him about how cold it gets in Minnesota). We got a letter from his pastor once, and recently we got a picture of him with his parents. I am confident that he is a real child who really benefits from my sponsorship. One of my favorite things about Compassion is that they organize missions trips every year, and if you go along to your child’s country, they will arrange for you to meet them and their families, and to see their Compassion center. They will also help you arrange a meeting if you visit your child’s country on your own. I would love to meet Edouard someday, and who knows, maybe I will. But even if we don’t meet on this side of heaven I will enjoy exchanging letters and pictures with him and watching him grow up healthy and educated because of our little gift and the work of Compassion International. If you’re interested in sponsoring a child or supporting the work of Compassion, visit their website at www.compassion.com. Do you have a Compassion child? Tell us about him or her in the comments!